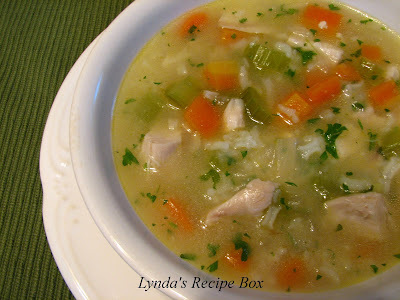 Lynda's Recipe Box: Homemade Chicken and Rice Soup - to Warm Body and Soul! Homemade Chicken and Rice Soup - to Warm Body and Soul! It's a cold day outside with this winter storm blowing through. Thankfully, we haven't gotten the 12 possible inches of snow that the weatherman predicted, only 3-4 inches, so far. But it's still snowing and very frigid. I was needing some body warming soup, and after looking through the pantry and fridge, decided to make a comforting Chicken and Rice Soup. This delicious, home style soup really hit the spot on this cold winter day. I used bone-in chicken breast halves, and my own chicken stock to make this delicious soup. But you can use leftover chicken and canned chicken broth, if desired. I like to saute the vegetables because it really adds a great flavor to this soup. The soup thickens if it stands very long before serving, so you may need more broth than called for in the recipe. Or, serve the thick soup in bread bowls for a hearty meal. Either way, it's a winner. Enjoy! In a large sauce pan, place chicken breasts and enough cold water to cover them and bring to a boil. Turn to low heat and add about 1/2 teaspoon salt, and simmer, covered about 30-40 minutes. Remove chicken from pan and cool. Meanwhile, add the butter or oil to a soup pot over medium high heat. Add the chopped onion, chopped carrots and celery and stir, letting them cook 4-5 minutes, til softened. Stir in the 2 tablespoons of flour and let cook a minute or so. Add 5 cups of chicken broth to the pot, stir well, and bring soup to a simmer and cook until vegetables are tender, another 10 minutes or so. Meanwhile, Debone the chicken breasts and chop into bite sized pieces. Add chicken to the pot and stir. Add more chicken broth, if needed. Season with salt, to taste, and stir in the parsley. Serve immediately. This is a bowl of fantastic comfort food! NOTE: Chicken broth and stock vary in the amount of salt content, so that's the reason I say "salt to taste". You need to taste as you go to get the right amount of salt for your family. I usually add salt by 1/2 teaspoons until I get it right. Since I have high blood pressure, I use less salt than many people. What a great looking soup! Do you have any tips on how to photograph soup? I never have any luck and I make soups a lot. The same storm came our way -- and it was a good day to stay inside, watch the birds and eat soup! Your soup looks fantastic. I'm in SE Kansas 5 miles from the Missouri border -- we're neighbors! We are getting the same storm. I live about 30 miles south of DC and they say we'll get 3 - 5 inches. Not bad but I'm sick of snow already. Your soup looks perfect for a day like today! Your chicken and rice soup looks so good. Soups like yours warm the body and satisfy the soul. Amazing. Thanks for sharing. Looks like a wonderful comforting soup. The sun is shining here in AZ but I'd still love to have some! Lynda, it looks like you have the perfect remedy to survive the storm. Your soup recipe is incredible. Perfect comfort food on a chilly day! I seem to remember my kids had a little book called chicken soup with rice. Going to have to ask them if they remember it. We are having nice weather (at the moment) so I will save this recipe for a rainy day, or our next cold front. This looks so delicious. I love chicken soup! I have never used rice in my recipe. I have no idea why but I am going to next time. Thanks for sharing! It looks so warm and tasty! Love chicken soup in the winter! I look at it and I am instantly comforted. Yes, your delicious soup would chase the winter chill away. Michele, thanks for the compliment. I take so many photos just to get 1 good one. Hi, Martha, we live in SW MO. close to Joplin. Barbara, that sounds like a cute story book. Grace, wish we had a wood stove to huddle next to-they are so cozy! I made chicken & pasta soup for dinner last night and our photos look almost like it's the same bowl of soup! Ha... take a look at mine! Oh chicken and rice soup sounds so good. I love adding rice to soups. I LOVE chicken-rice soup, but haven't come across a good recipe in years. It looks like I found one that I will enjoy preparing. Lynda, I look forward to trying your recipe. Pulled Pork, Crock Pot Style! Family Recipes- December's Round Up!